I recently changed the name of my blog to Eating Paint.... yay! For an explanation of this, please see the side of any paint tube where it tells you about what happens if you absorb the paint into your skin or you accidentally ingest it. Some are okay and perfectly safe. Some have blends of pigments and minerals and chemicals that are just so to a point that they might give you cancer. Anyone else really like the smell of turpentine and other solvents in their studio? (not sarcasm, I like the orange scented mineral spirits) Okay, that was maybe a bad question to ask... but I changed the name of the blog to something that is about as absurd as I feel when I try to explain my work in a post that is just long enough to actually accomplish the explanation but short enough to please web and social media gurus. It feels like eating paint. I love to paint more than anything but I know that eventually it might hurt my brain more than the epilepsy, then I seal it up where said paint can't damage anyone else, under a pretty sheer varnish. Then I remember how nail polish is automotive paint, and I haven't worn nail polish since my wedding. And I shape my brushes back into their store-bought shapes after cleaning how? By sticking them in my mouth... who knows how much paint I've really eaten over the years. But I do have a new painting... It was posted on other sites before this blog. It is in reference to this odd little bill coming up in our legislative session, which is about children having their rights to "Brandishing a pastry or other food which is partially consumed in such a way that the remnant resembles a weapon" protected (yep, pasted that from the bill). You may have heard about that kid with the Pop Tart.... who thought it looked like a mountain, and then a gun. Reductio ad absurdum is Latin for reduction to absurdity- or disproof of a proposition by showing that it leads to absurd or untenable conclusions. I don't really make a lot of "political art," but given the opportunity to show politicians being absurd... there's an opportunity to make a visual statement. This is one of my acrylic pieces with a textured underpainting. Kids With Guns is also a Gorrilaz song... one Youtube version is here. 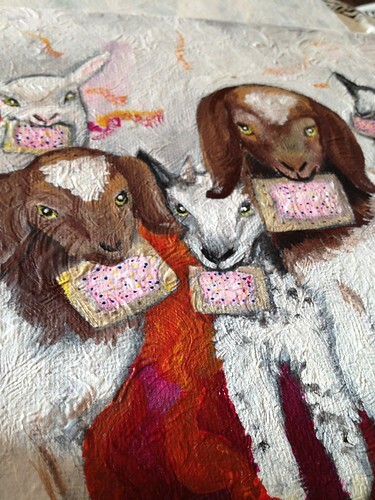 To top it off... we also have this bit of absurd going on around our state capitol dealing with our First Amendment rights... so the kid goats in my painting may lead others to different conclusions about meanings. For more absurdities you can visit my website or follow me on Twitter.